Stained Smile? Teeth Whitening in Washington, DC Offers a Solution! Everyone wants a bright smile, but there are obstacles that stand in the way of that stunning set of pearly whites. For example, everyday eating and drinking can discolor teeth. Plus, most people’s teeth aren’t naturally white to begin with! How can you conquer these issues and achieve the brilliant grin that will turn heads wherever you go? Professional teeth whitening in Washington, DC may be the ideal solution for you. White teeth can draw attention away from the signs of aging on your face, helping you to appear more youthful. A beautiful smile can boost your confidence and help you make a great first impression, whether you’re meeting new people at work or getting back into the dating scene. Professional whitening is one of the most affordable cosmetic dentistry treatments, and its results can last for years if you take a few simple steps (such as sticking to a good oral hygiene routine) to maintain your new look. In-office whitening. With this fast and simple procedure, your teeth can become several shades brighter during a single appointment! The doctor will carefully monitor your procedure to help you attain the results you want without endangering your oral health. Take-home whitening trays. Some patients prefer to whiten their teeth in the comfort of their own home. With custom whitening trays, you apply a high-strength bleaching gel to your teeth. You leave it on for the prescribed amount of time each day until your smile reaches the desired level of brightness. Crest 3D White whitestrips. We offer the most powerful whitestrips available; you can’t purchase these at your local grocery store! These are easy to apply and can dramatically whiten your smile in just 14 days. Opalescence take-home whitening. These trays come pre-loaded with a high-strength whitening solution. You may find that the bleaching process temporarily makes your teeth more sensitive than usual. Dr. Obholz can offer advice and products to mitigate the sensitivity so you can enjoy your improved smile with as little discomfort as possible. Are you ready to experience the improved confidence that comes with a dazzling set of teeth? Talk to your dentist about professional whitening at your next appointment! Dr. Yelena Obholz is a general and cosmetic dentist who is committed to providing her patients with personalized, innovative treatments that benefit their oral health and make them feel great about their smiles. If you would like to speak to her about improving the appearance of your teeth, contact our office at 202-364-8989. Comments Off on Stained Smile? 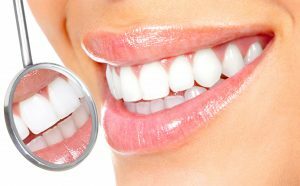 Teeth Whitening in Washington, DC Offers a Solution!